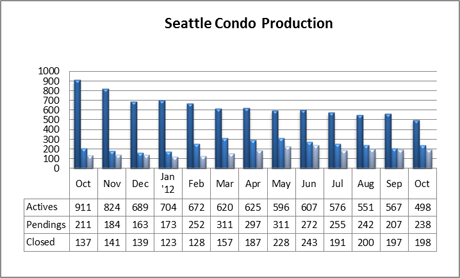 If but for one month the Seattle condo market rebounded in October with across the board improvement in median sale prices, pending and closed transactions, while the number of available condos for sale fell below 500 units for the first time in nearly seven years. 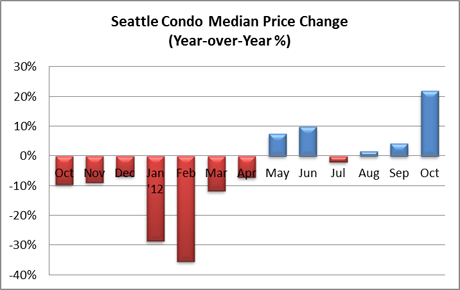 Seattle’s median condo sale price increased for the third consecutive month, spiking 21.84% year-over-year to $275,362 in October, which also reflected a 10.1% one-month improvement. Two possible reasons for the increase may be attributable to 1) a larger number of unit sales, 2) a stabilizing market place and 3) a reduction in distressed properties. 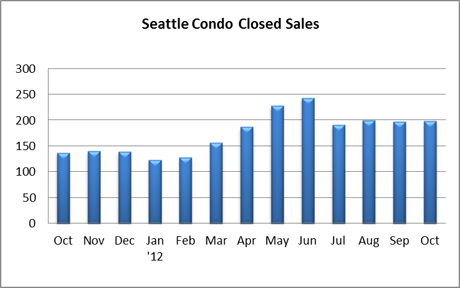 Last October, 35% of all Seattle condo sales were distressed (bank-owned or short sales) compared to 23.6% in October 2012. Condo sales continued to trend up with the number of pending transactions rising 15% over September and with a one-year improvement of 12.8% to 238 units last month. 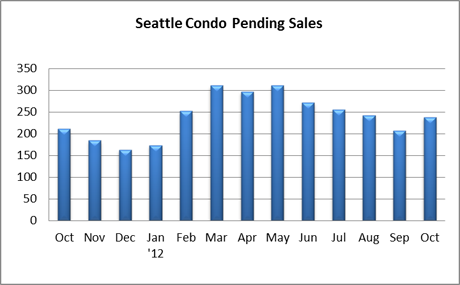 The number of closed Seattle condo sales jumped 44.5% over last October to 198 units. Closed sales have remained steady and given the strong sales activity in October, the November closed volume should reflect similar results next month. The number of available condo units for sale reduced to the lowest number in almost seven years, dipping below the 500 unit threshold. 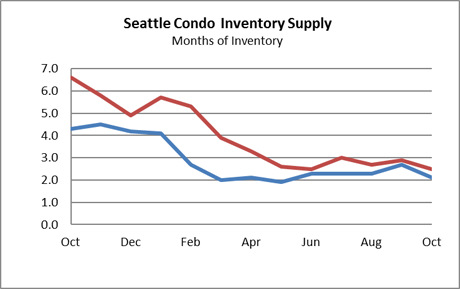 Combined with a steady sales velocity, the Seattle condo inventory supply rate dropped to 2.1 months of supply based on pending transactions and 2.5 months based on closed volume. 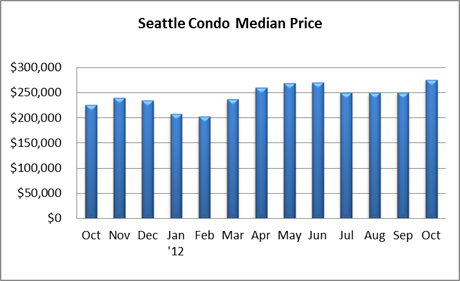 Seattle’s condo market has reflected a seller’s market throughout 2012 and it’s not likely to ease for several years.